Benefits of getting professional carpet cleaning in Mill Creek,Wa. Benefits of getting professional carpet cleaning in Mill Creek,Wa.Among the pleasures of being a homeowner is that you may customize your home with any decorations you like including top quality carpet.In fact , it really is one of the most prized items in your home. Furthermore, you will also take pleasure in the benefits of getting professional carpet cleaning inMill Creek,Wa.Yet just like any of your belongings, there will come a time you want to clean your carpeting. The problem here is that you could simply dust off your own carpet.Vacuuming can help but it will not be able to get deep down and after a while it just builds up to much.Vacuuming can only go so far don't get me wrong it is a good idea to vacuum 2 or 3 times a week,The only thing that you can efficiently do is have your carpet professionalycleaned. Expert companies like All Star Carpet Cleaning provide ease of of appointment making.Allow us to get your carpet cleaning and get rid stains and serious seated dirtwhich has been accumulated for a while. You don't have to worry about health problems because we understand what we are doing.A good firm like All Star Carpet Cleaning will restore your carpet back into the clean state as good as new. We have the proper tools and machines as well as theproper methods to make your carpet clean. Consequently, you will not waste time, cash and effort doing the task on your own. 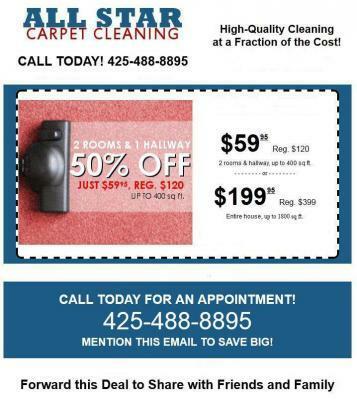 Benefits of getting professional carpet cleaning in Mill Creek,Wa.